We have FINALLY completed Lucy’s nursery! Please take a scroll through Lucy’s hippity hoppity nursery! We have FINALLY completed Lucy’s nursery! What started as a very blue bedroom has now been transformed into Lucy’s gray, white, and pink bunny themed bedroom. Bryan made his striped accent wall vision come to life and we had brand new carpet installed throughout the house to give the room a much needed update. Please take a scroll through Lucy’s hippity hoppity nursery <3. We restored this diaper cabinet which has been passed down through my family. Now, all that is missing is our sweet baby! Oh yea, Rooney wanted to let you know that HE helped too! One of the greatest aspects of college was being able to work alongside talented classmates and learn from each other through group projects and critiques. I went to college with some REALLY talented designers. Studying Visual Communication Design at Stevenson University provided a wonderful academic experience. I not only learned the techniques and fundamentals of graphic design, but also took a broad range of communication and multimedia classes (photography, videography, film, web design, and fine art) which expanded on the design program. One of the greatest aspects of college was being able to work alongside talented classmates and learn from each other through group projects and critiques. One classmate’s art in particular has stood out to me not only while in college, but since graduating. Eric Bach and I have kept in contact through social media over the years. His cute wedding photos, adorable puppy, and music (he sings and plays guitar too!) have popped up in my feed along with several pieces of artwork that he has done since our Stevenson days. One fine art series in particular, has stood out to me most. 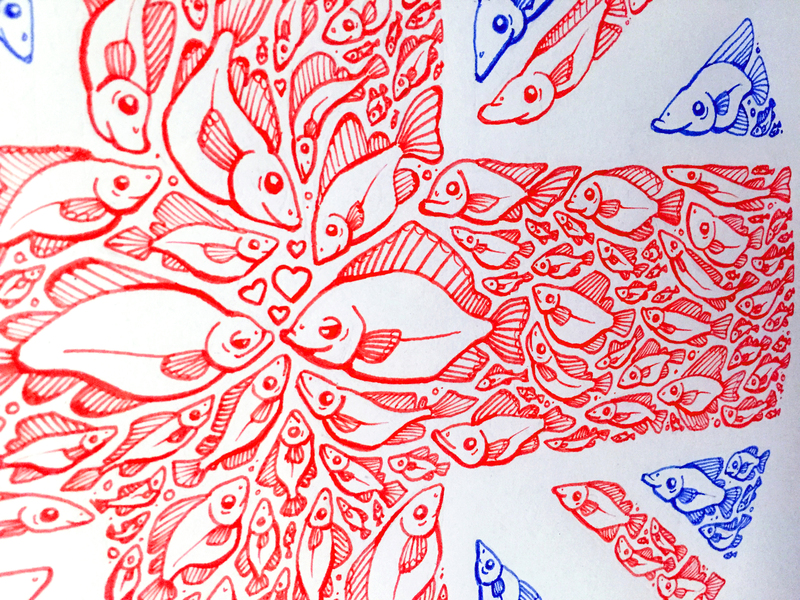 The series consists of very intricate circular fish drawings that use negative space to create what I will call a puzzle of fish. Check out Eric’s behance portfolio which feautres his fish series and other projects by clicking here: Eric’s Portfolio. If you don’t know the back story, Bryan and I have had nicknames for each other of “fish” & “feesh” since we met (I’m not 100% sure where it came from, but I’m guessing the movie Big Fish played a role). 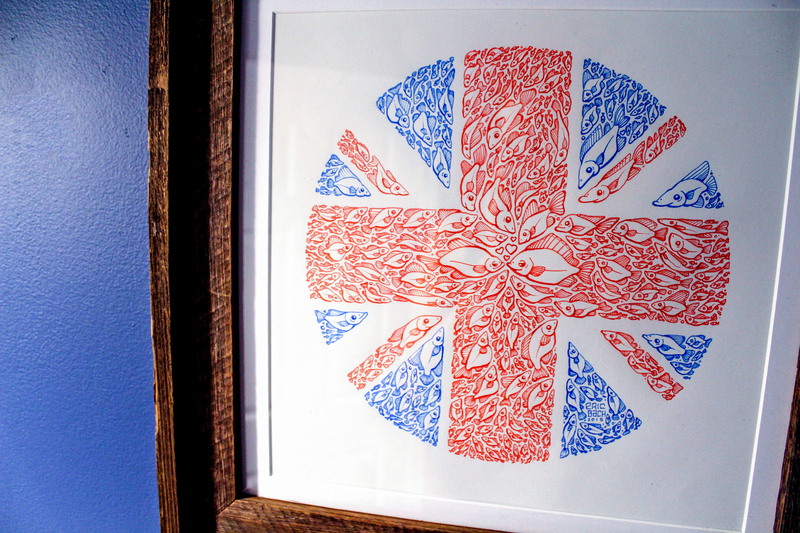 When I saw Eric’s fish art I was instantly drawn to it. I reached out to him on a whim to ask about buying a print of a piece that I had seen on his page. To my surprise, he was not only willing to sell the print, but he offered to do a custom piece especially for us. I was extremely excited about this and I told him that I would LOVE that! I didn’t give him much direction to go off of, but I did mention that Bryan and I are a wee bit obsessed with the British culture and that our wedding had an overall British theme so maybe there could be a fish with a crown or something thrown in there. Eric let me know he had finished the piece but it was going to be a surprise, so I eagerly awaited it to come in the mail and didn’t see it until the day it arrived to my front door. The piece COMPLETELY EXCEEDED any thought/idea I had at what it might look like! I gave this piece to Bryan for our upcoming 2 year anniversary. It is truly something that we will cherish forever and display proudly in our home. Honestly, it’s the coolest piece of art I have ever owned. Last weekend, I hung it in our newly painted bathroom which was in desperate need of some artwork. 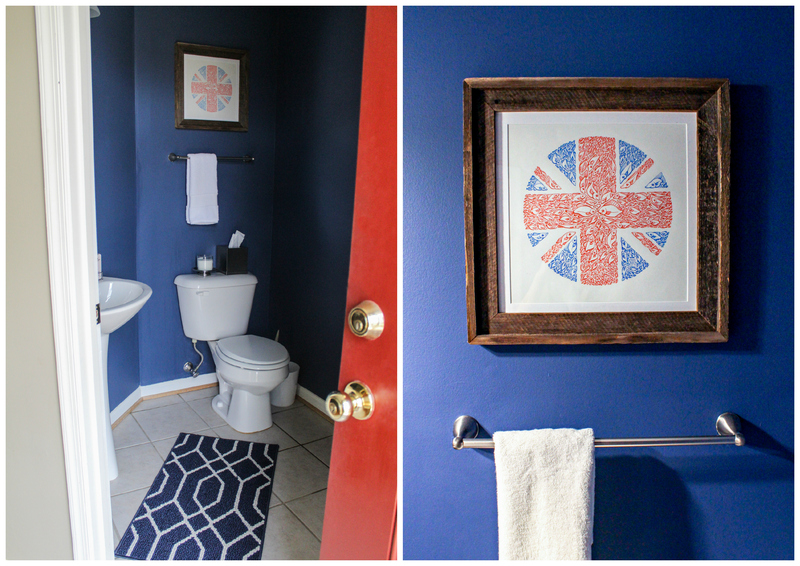 The reds and the blues of the Union Jack design really complemented our new navy paint. I framed the print with a custom handmade frame that was made for me by Jim at Bardwood4U. 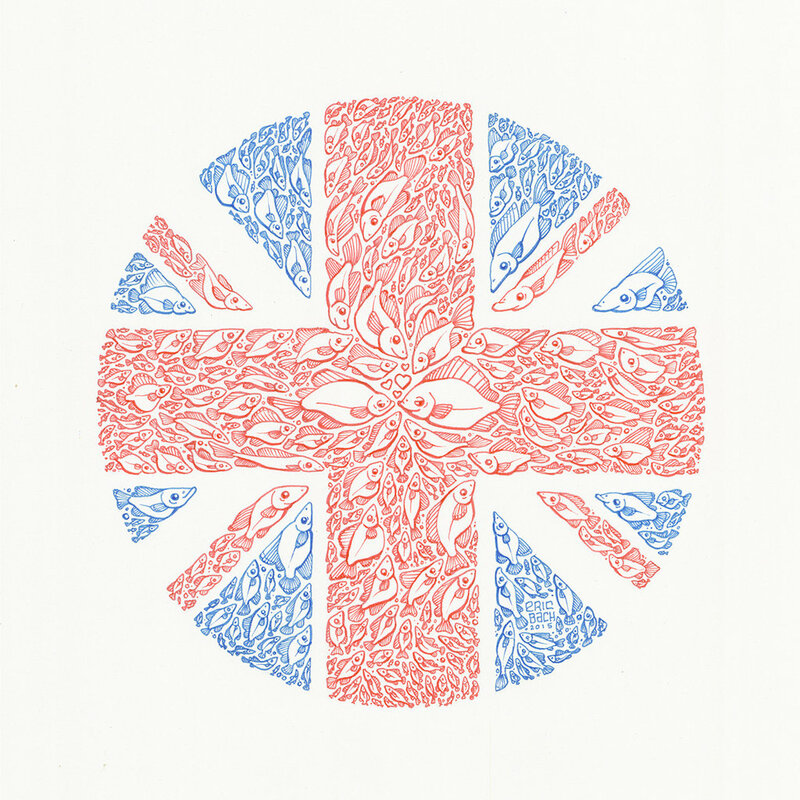 Please check out these photos below and marvel at the hand drawn perfection and intricacy of Eric’s piece, “Fish and Chips”.